Ugly Christmas Sweaters are likely to be a thing again this year. 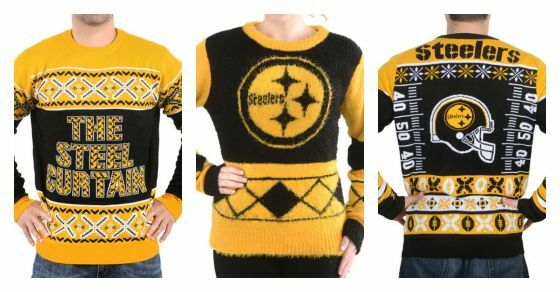 What better way to celebrate the holidays than with a Pittsburgh Steelers Ugly Christmas Sweater? I actually bought one last year and wore it most Sundays because it was too much fun not to! Fanatics has a selection of a few different styles, some geared more toward men and others toward women and they even have a Youth version. One of the cutest things, though, is the Pittsburgh Steelers Ugly Sweater Bear. At only $12.95, it would make a fun gift for Steelers fans of any age. What do you think? Would you wear them? And how could anyone call that bear ugly?? These are awesome. Go Steelers!